Excerpt from Goodreads…“Excuse me,” said Alice to a small grey Mouse in red shorts. “What precisely is a custard race?” — Did Alice’s Adventures in Wonderland and Through the Looking-Glass leave you yearning for more? Join Alice on a new journey and meet the extraordinary inhabitants of Wonderland, both familiar and new. If your bed turned into a boat, and you found yourself “drifting off” in an entirely unexpected manner, how would you find your way home? The Jack of Diamonds says it’s Alice’s own fault for being fast asleep — had she slept more slowly, she wouldn’t be so far from home! The Red Queen, the Mah-jong Dragons, even the Red King’s Gamekeeper, all seem helpful enough at first — but things never quite turn out the way Alice hopes! Brimming with word-play, nonsense verse, and a cast of eccentric characters each with a unique and peculiar logic, this tale is faithful to the style of the originals, picking up the pen where Lewis Carroll put it down. Be swept away on a torrent of humour and madness. Alice is back! Most of you can probably guess from my past giveaways, that I am a big Alice in Wonderland fan! 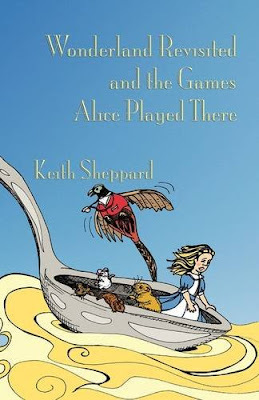 Keith Sheppard contacted me about reviewing his book, a take off from the Lewis Carroll series. Mr. Sheppard wrote Wonderland revisited and the Games Alice played there” for his daughter who was forever asking him more about ALice and her world. He takes us to Wonderland via a bed with a spoon and her pet puppy comes along. I enjoyed all of the plays on words and sharp humor. The reader will meet a unicorn, owl, dragons, frogs, a mole, the Queen of Hearts and a gardener along the journey. And will be taught old and new games. Now if she could only figure our how to get back home…Nothing is quite the same in twisted Wonderland! I would recommend it for Alice fans and gave it three stars!